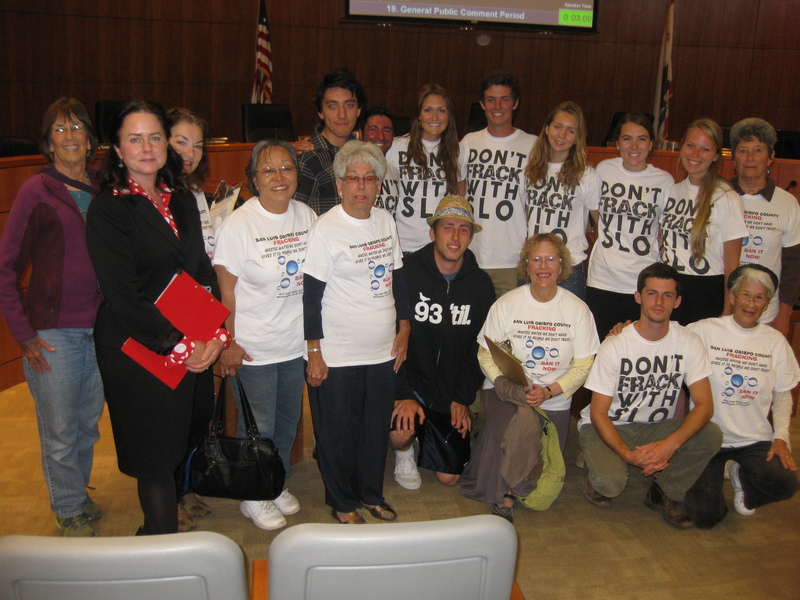 SLO Board of Supervisors issues a gag order on fracking opponents. Tuesday, May 20, 2014, San Luis Obispo County Board of Supervisors Meeting. Anxiously and proudly the Students against Fracking, Cuesta and Poly coalition, attended their first Board of Supervisors meeting in the middle of mid terms and finals, to deliver 750 signatures calling for a countywide ban on Fracking and about 20 other persons from all over the county and local grassroots organization SLO Clean Water Action using the public form to deliver 3500 plus signatures collected from county residents and farmers, people across the State and around the world, calling on the BOS to adopt a countywide ban on Fracking. I was one of the persons representing local grassroots organization SLOCWA standing with the Students against Fracking. Bruce Gibson, Chairman of the Board, during a recess approached me. Why me in particular? I do not know. He announced that too many people signed up to speak. I didn’t know what that meant. Did not know there was a limited number of people allowed to speak in the public comment segment. It’s not posted anywhere. Gibson further announced to me that only 4 people could speak and time is limited to 3 minutes each. I knew about the 3 minutes. I was hearing limited to 4 speakers for the first time. I was stunned to learn this just minutes before we were due to make our presentation. Again, why was he giving me this information and not the entire audience? Coming from the Chairman of the Board I trusted this change was something of an official nature and compliance was the only option. There were more than 4 people who had signed up to speak. I was sure of that. I had no idea what was regarded as “too many.” I begged for more time. I begged that everyone be allowed to speak. He was insistent, “No”, he repeated. 5 people I begged. 15 minutes I begged. My hands grasping his in desperation. Please, I pleaded. Reluctantly he nodded and agreed. I thanked him. I Begged. I thanked him. Not a proud moment. I only know Mr. Gibson as an official. When he approached us I assumed it was official business and from the request forms we filled out he knew why we were there. Also, we were all wearing tee shirts espousing to a countywide ban on Fracking. There were other green tee shirts in the audience and I wondered if they were presented with the same directive from Mr. Gibson? And what about all the people who had filled out speaker slips? Were they all being informed of this sudden change that only 5 people total were going to be allowed to speak? Public comment is an agenda item. Addition, subtraction, corrections to an agenda item must come in the form of an addendum which must appear with the agenda. This is how Item # 19 on May 20th appeared on the agenda. 19. The general public comment period is intended to provide an opportunity for members of the public to address the Board on matters within the Board’s purview that are not scheduled on the current agenda. Individuals interested in speaking are asked to fill out a “Board Appearance Request Form” and submit it to the Clerk of the Board prior to the start of general public comment. When recognized by the Chair, each individual speaker may address the Board and is limited to a MAXIMUM of three (3) minutes or a reasonable period of time as determined by the Board Chairperson. There was no addendum to this Item. In the interest of time, a MAXIMUM of three (3) minutes will be reserved for your presentation. Please submit this completed form to the Clerk of the Board prior to the item. It is requested that you remove your hat in the Board Chambers. please remember to turn off your cell phone while in the board Chambers. Public Comment remarks should be directed to the Chairman and the Board as a whole and not to any individual thereof. No person will be permitted to make slanderous, profane or personal remarks against any individual. May we have your phone number and/or email in case we have follow up questions? Please note: This is public information and may be disclosed upon request. Telling us only moments before we were prepared to make our presentations that a total of 5 speakers were allowed to speak on this agenda item is an addition to item #19. Clearly an addendum was in order. No addendum was posted. When the meeting resumed, agenda item #19, public comment was introduced, Mr. Gibson, rather than calling names from the submitted slips as was the usual procedure, he unexpectedly announced that five unidentified speakers will come forward, state their names and time starts ticking. This was unprecedented. A point of order was in order. Where was county council? Where were the other Board members? The Supervisors must have known that their constituents from their districts there to speak had just been indiscriminately culled by the Chairman of the Board. Every supervisor must have known that every person who filled out a request to speak form and will not be called, was served a gag order by the Chair. They had to know this. It is their job to know these things. It is county councils job to know these things and insure proper legal procedure is adhered to. Not a peep from anyone. The Chairman speaks for all the members. So unless a supervisor objects, county council or Clerk of the Board calls for a point of order to what the Chairman is doing, it is assumed that it meets with their approval. Silence is consent. We have to trust at this point that what is about to happen is legal and proper. Since those put in charge of making and enforcing the law are allowing this to proceed, then it must be legal with consent and with knowledge. So here is how it all went down. When Mr. Gibson, who had approached us just moments before, looked in our direction and said “speakers step forward” we assumed this was our cue to do what he instructed us to do. Heidi Harmon opened the comments, followed by 3 students, David Kooi, Cuesta, Andi Fieber and Lucas Carlow, Cal Poly, spoke elegantly expressing their concerns about their future and the future of our environment while delivering 750 + signatures from students calling for a ban. I closed by delivering petitions from local farmers and residents, petitions signed by people from across the State and around the world. Official letters from the Board’s peers, the San Luis Obispo City Council and the Arroyo Grande City Council, calling on the Board of Supervisors to join us in adopting a countywide ban on fracking insuring our health, safety and well-being. I included a draft response to our request for their consideration in the interest of saving staff time which always seems a reason to delay action. I had tied the petitions up in a gold bow and as I left the podium to deliver it to the Clerk of the Board across the room, when I hit the center of the room, I turned to the audience and rather triumphantly waved the petitions in the air. The entire room waved back. We are not allowed to clap or make noises in chambers. Raised hands is accepted protocol to show approval. Every hand I could see was raised to the rafters. Four other people did come to the podium. I honestly do not recall their names being called. But if they were, how did that happen? We were told there was only time for 5 speakers. At the end of ‘public comment’ Mr. Gibson instructed staff to alert Water Resources Board and the Planning Dept. to look into the fracking issue. I do not think anyone knew what it was he was instructing them to do or how that was going to qualify as a response to join us in adopting a countywide ban on fracking. Nonetheless, everyone on the board nodded in agreement to Gibson’s instructions. No one objected. Silence is consent. Gibson estimated that it would probably be several months before anything will get on the agenda. I don’t think they got the message that we are TELLING them we do not want fracking in this county. And what we were asking from them was a vote to assure us that they share our vision of a safe, healthy, happy, livable and prosperous future. Or, maybe they did hear us. Maybe they did know exactly what we were saying and they did respond. They responded with a lie. They told us we cannot speak. They told us they do not want to hear what we want. They told us they do not care. And how ironic is that? That is exactly the same message the oil industry has been sending to every community across this land. We can lie and we don’t care. I want to thank the Board. Now, we get it. We get that you don’t care and you can’t be trusted. And now it is our turn to respond in kind. We do care. A lot. And we will make lying, cheating and the stealing of our natural resources and quality of life a crime in this county. We will not be silenced. We will prevail. This entry was posted in All, Commentary, Events, San Luis Obispo County, SLO against Fracking, Updates and tagged gag order, San Luis Obispo Board of Suprvisors, SLO Board of Supervisors, SLO County gags fracking opponents.. Bookmark the permalink. It would be interesting to see how much oil and gas money is being funneled to the BOS of SLO. This was clearly an action taken contrary to the established rules governing the conduct of the BOS meetings. It is very reminiscent of the Darrel Issa trick a few weeks ago! Gibson works for big oil. He is not your friend. Joey the goal is to get a countywide ban on fracking. The way to do that is to get a ordinance on the books that makes the illegal and unlawful taking of our natural resources and quality of life a crime. Mr. Gibson’s campaign for re election is irrelevant and of no consequence to our achieving our goal. Focusing voters and rallying the troops on a fracking ban is where our energy should be going and is much more productive towards that end. What happened at the Board meeting was merely an opportunity for Mr. Gibson to show his true colors and where his heart lies. He is in a position of power and able to demonstrate exactly how he intends to use that power. Our power, our voice, our approval or disapproval, our response, speaks for itself on election day. We have the final say in these matters and that’s what really counts. We really don’t have to do anything but vote. Don’t you agree?